I hope you're enjoying this book study as much as I am! There's so much to reflect on that I'm having a hard time narrowing it down. If you missed the first 2 parts, you can catch up with Chapters 1-3 HERE and Chapters 4-5 HERE. Since so many teachers are required to use their district-mandated math curriculum, former high school math teacher Dan Meyer gave a TED Talk called Math Class Needs a Makeover. If you have not seen it yet, you must watch it HERE. He compares the difference between reading a word problem in a textbook and demonstrating the same problem in real life. Meyer argues that "students lack initiative, perseverance and retention because they spend most of their time plugging in formulas without understanding the mathematics." (p. 114) Our goal should be for students to learn and understand math by working on problems, NOT just to get the write answers to textbook problems. Amen! I love the following "math problem as room" analogy by Seyour Papert (1980). The best math problems have low threshold (entry points accessible by all), high ceilings (allow for differentiation and deeper investigation), yet open middles (multiple solution paths to the same answer). Check out this fantastic website, Open Middle . It's a free resource organized by strand and grade level. 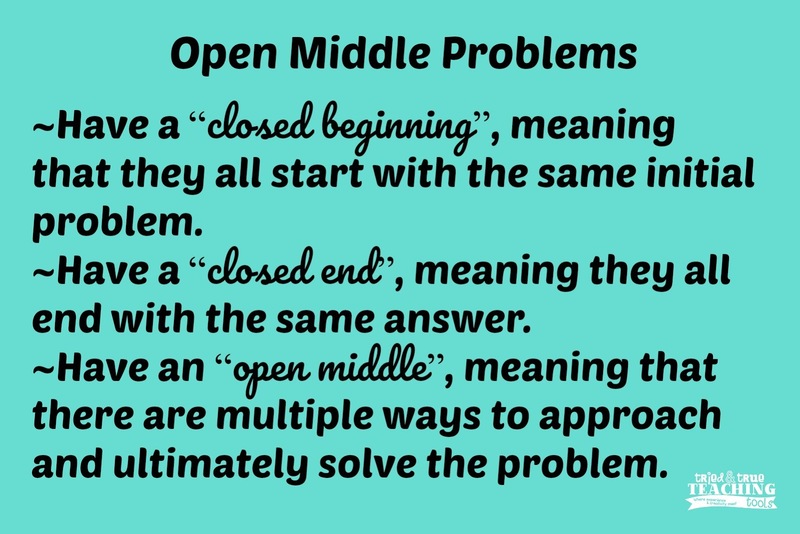 There are hundreds of "Open Middle" tasks posted! 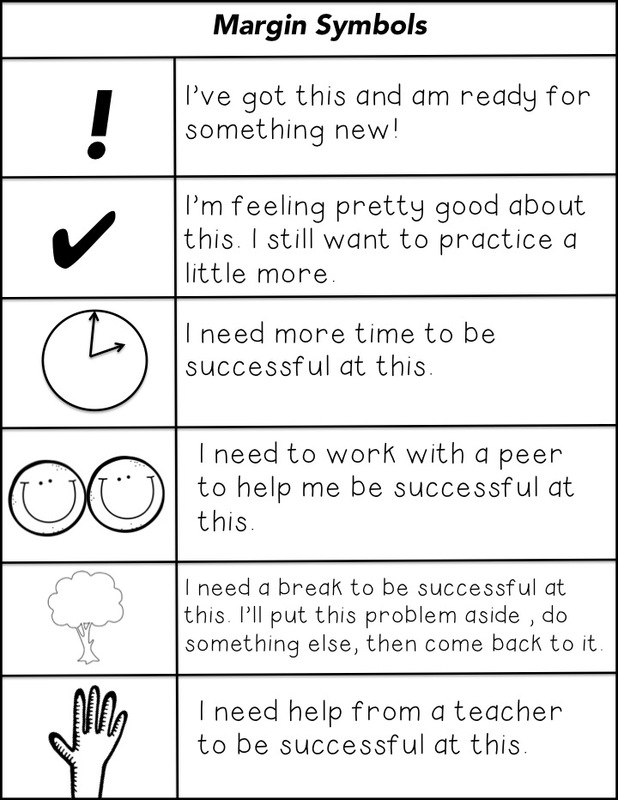 Did you notice the growth mindset language: to be successful, assuming all students WILL be successful? What a great strategy! 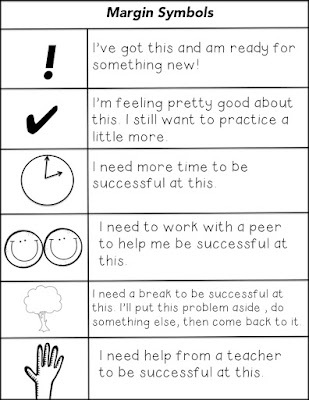 This is teaching students to be responsible for their learning and to learn how to say what they need. (Remember the importance of precision in Chapter 5? Review that HERE) Using symbols also allows students to move on, with the intent to revisit the problem. I love this! I'm going to introduce it to my class this year! Growing up, I memorized formulas and rules, yet I never understood the WHY these rules worked and therefore, I didn't know when to apply them. 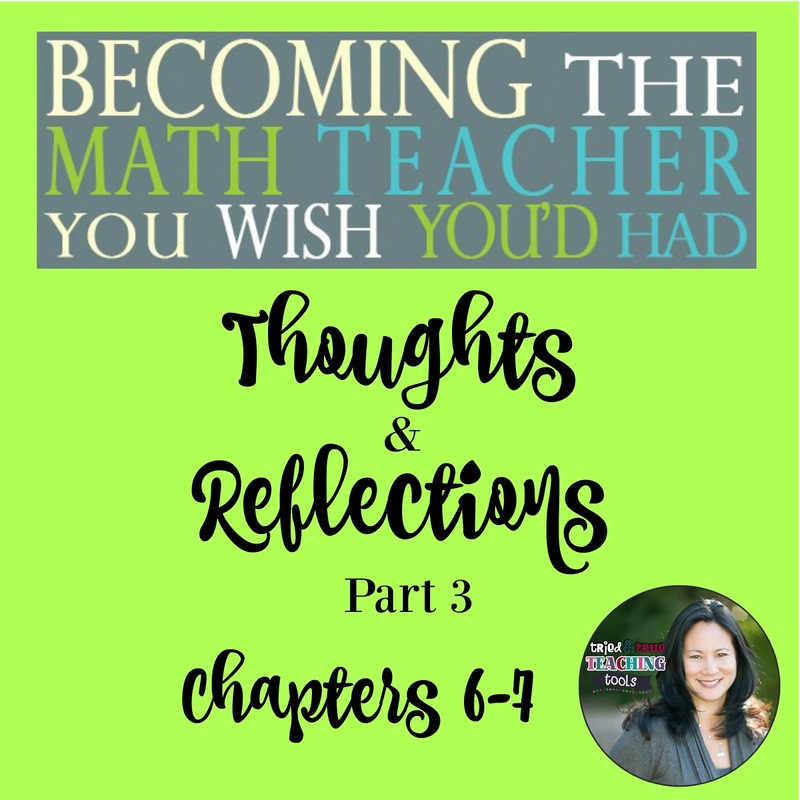 When I became a teacher, I was determined to understand math so I could help my students understand math. A website to help us teachers develop our own mathematical content knowledge and improve our teaching is Ask Dr. 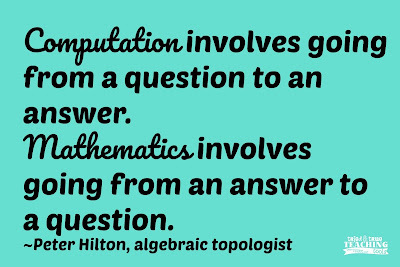 Math , a free question and answer service, sponsored by NCTM (National Council of Teachers of Mathematics). Although it is no longer taking new questions about math, there is a terrific searchable archive available by grade level and math topic, as well as summaries of Frequently Asked Questions (the Dr. Math FAQ). Try it; type in a math question to see if it is in their database. It's so interesting! 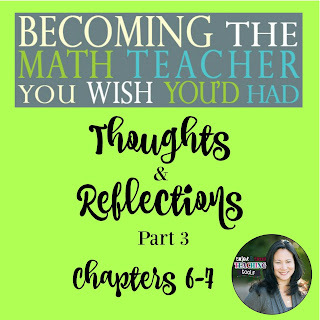 Chapter 7 focuses on the importance of questions, as opposed to the typical math classroom that focuses on finding answers. Giving students the opportunity to ask questions without the pressure of finding answers begins to encourage risk taking, inquisitiveness, and playfulness. 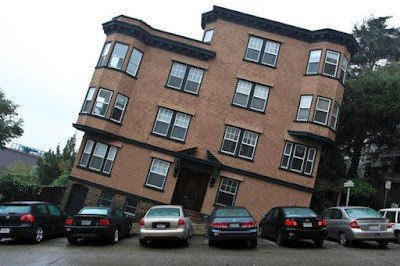 A great website Zager recommends is 101questions (101qs.com) There are hundreds of thought provoking photos and short video clips, such as this San Francisco house below. What question do you think most people ask? What question would you really want an answer to? Did anyone else's question inspire you to think of a new question or add on to theirs? What's a question you heard today that was surprising/interesting/thought provoking to you? Did you ask any questions we could figure out using mathematics, if we wanted to? Julia was buying DVDs of her old favorite TV series. She bought eight DVDs at the store and she bought seven online. After recording student noticings (observations) and wonderings (questions), either reveal a question you'd like them to solve (the problem) or have students come up with a question by asking, "If this picture/scenario were the beginning of a math problem, what could the math problem be?" Ray-Riek described the benefit of Notice and Wonder: "Leaving off the question and just sharing an initial story/scenario/image increases participation from struggling students because there are no right or wrong answers to 'What do you notice?' and 'What are you wondering?'... 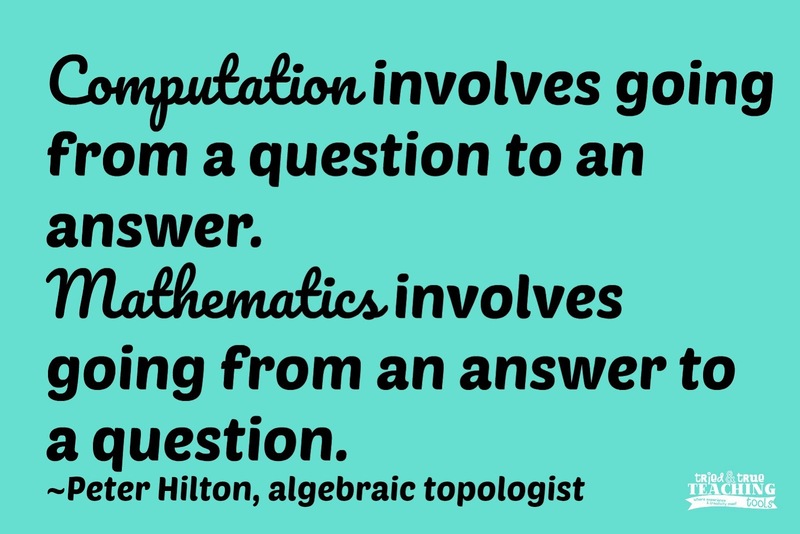 Through wondering, students see that math problems come from their own thinking." (p. 144) What a terrific way to get students to think and apply their math knowledge! This helps to eliminate kids immediately grabbing numbers and trying to "do things to them". It's also interesting to see if students come up with the same question the textbook intended! Which of these noticings have to do with math? Which of these wonderings could we use math to help us answer/prove? Which of these did you use math to think of? Which of these could we use math to explore more? I'm excited for school to start so I can teach my new students to use math margin symbols and to notice and wonder! Have you tried remaking your textbook word problems to encourage kids to slow down and think before solving? I'd love to hear your experiences!